In Support Of Responsible And Safe Wildlife Viewing! I see quite a few folks out wildlife watching with massive 10X50 binoculars. You really don’t need anything that powerful when choosing a good pair of bino’s. I personally use (as of this writing) a pair of 8X30 Swarovski’s. If I need anything more powerful than that—– I go to the spotting scope. Hand holding a pair of 10X50 binoculars can be challenging. Number one, your field of view is going to be very narrow which can make locating a walking or even running wolf difficult unless you can mount the binoculars on a tripod, and trying to hand hold a massive pair of bino’s is nearly impossible for any length of time. 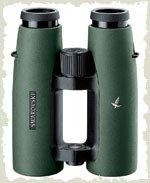 A pair of binoculars in the 8X30, or 7X35 range will give you a clearer view with more light, be very easy and light to hand hold for long periods of time, and most importantly give you a wider field of view for locating the object you are searching for. When choosing a new pair of binoculars I prefer a medium sized, fairly light weight pair. Those tiny pocket bino’s do a decent job and are lightweight. The larger high powered bino’s are not as easy to hand hold for very long, and they put too much weight on my neck when I’m hiking. Medium sized bino’s fit my hand well, and they don’t weigh a ton, and give me a wider field of view. Make sure the pair you choose is nitrogen gas filled, so that they do not fog when the weather is wet, cold, or humid. There are many great manufacture’s to choose from. My best advice is to spend some time looking through many different pairs—outdoors in real life situations will give you your best test, but you can get a decent feel and look while in a large store. Place the strap around your neck, and walk or stand for awhile to see how they will feel when your hiking. Is the weight ok? Does the strap cut into your neck? I know it’s going to look like I’m really pushing Zeiss on this page, but they do make an excellent product, and often at a more affordable price. You just can’t beat their products. The exceptional glass, clarity, and reliability are the best. If I had to buy a new pair of bino’s today, I would choose the Zeiss. The list of spotting scopes on the market today is long and varied. 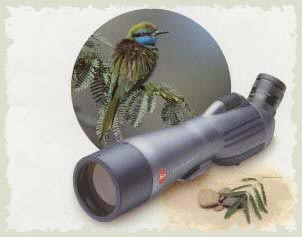 One of the most frequently asked questions I get every year is, “what is the best wildlife spotting scope” ? And, since I spend so much time in the field, often among large groups of wolf and bear watchers, I get to look through hundreds, maybe even thousands of different spotting scopes every year. I carry and use three different scopes. Every spotting scope on the market has its own advantages and disadvantages. Which scope is best for you would depend on how much you can afford to spend. How often you plan to use the scope, and what types of activities you plan on using the scope with i.e. ; Backpacking, you’ll want a light packable scope. Parking in a pull-out and watching wolves or bears in Yellowstone, your options would be unlimited. The best spotting scope on the market today is the Zeiss Diascope 85. This model features an angled view, which is great when you have people of different heights all using the scope. The viewing eyepiece is large and the object in view is large, super bright and clear. The eyepiece can be rotated to the side, for use from a vehicle window mount, or for younger kids to look through without dropping the tripod to a lower height. The large 85mm objective lens is the largest on the market and allows you to view earlier or later in the day when most scopes go dark from lack of sunlight, but when most wildlife are active. In fact, I generally get another 30 minutes or more of viewing than other wolf and bear watchers. Different eyepieces are offered but I prefer the 20X60 zoom myself. The eyepiece also includes a handy feature which allows eye glass wearers to use the scope easily. Gas filled, making the scope water, and fog proof. Lightweight–the lightest high end scope on the market! $1600. Lifetime transferable warranty. The only high end scope with this type of warranty, and not a bad price. It’s actually the least expensive high end scope on the market! Less money, more scope…….what else could you ask for? In every head to head test that has been conducted in real life field tests with high end spotting scopes, the Zeiss Diascope 85 has come out on top and declared the best. The second scope I carry and use is the Fujinon 80. The large 80mm objective opening is large enough to allow you to use to the scope late or early in the day. Some clients find the close eye relief eyepiece easier to view through, and some find it more difficult. The view is decent and bright, but not as bright or as clear as the Zeiss. Still, a great scope, and one that I rely on everyday. 20X60 zoom eye piece. This scope will fog and is not gas filled. $1000. limited warranty. 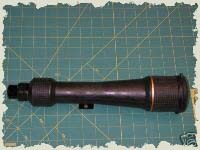 The third spotting scope I use is the Leopold Gold Ring. This scope, although not large provides an excellent view. The optics are great and the long eye relief makes it easy for eye glass wearers to use the scope. 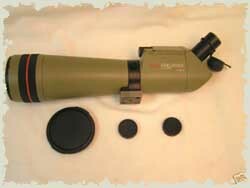 Eyepiece is fixed power at 35mm with a 40mm objective opening, and the scope is armor coated. Excellent choice for kids to use and for backpacking. A very compact scope. $800. Sealed gas filled, fog and water proof. Drawback? 40mm objective lens makes it difficult to use at dawn or dusk. 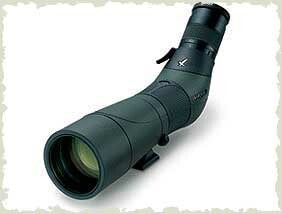 The Swarovski 80mm scope is one of the more popular high end scopes you’ll see in Yellowstone. Sells for about $1800. and the warranty is limited and non-transferable. I personally had a difficult time viewing through this scope and most of my clients did not like the view but preferred the Zeiss. Different eyepieces to choose from, but the 20X60 is the most popular. Gas filled–water, and fog proof. Eyepiece rotates for use with a vehicle window mount. The Kowa is also a popular scope with some wolf and bear watchers, but the eyepiece is small and difficult to view through for extended periods of time, and even more difficult at 60 power. The 40mm objective lens makes this scope difficult to use at dusk or dawn. Heavy and somewhat bulky. Sells for about $500. Fog and water proof. 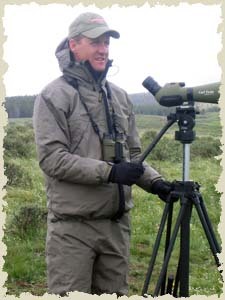 Leica’s Televid 60 is also a popular high end spotting scope among the wolf and bear watchers in Yellowstone. The Leica has a large eyepiece, bright and clear. The object viewed is large, but not as bright or sharp as the Zeiss in my opinion. The small 60mm objective will not provide enough light at dusk or dawn, and is best used with full sun. Gas filled, water and fog proof. Sells for about $1800.—one of the more expensive scopes on the market. The Leica is also one of the heavier high end scopes. Limited and non-transferable warranty. A choice of different powered eyepieces, but the 20X60 is the most popular. There are many other scopes on the market to choose from. Cabela’s, and other sporting goods stores offer scopes at various price ranges. Don’t forget to check out eBay. Some great deals can be found with a little searching online. Having the right tripod is actually as important, or more important than the spotting scope. Forget that cheap tripod you see at your local discount store. Go to ebay or a used camera store and check out a Bogen tripod with quick release pad. Those flimsy, cheap tripods you might be tempted to buy will only give you trouble in the field. Spend some money and you’ll have years of trouble free use. A really great used Bogen tripod on ebay will sell for between $100.-$300. 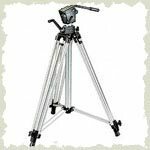 I prefer, and own 3 of the Bogen 3046 tripods (painted black), each with a 3063 fluid video head. The reason I use a fluid video head -vs- a standard camera head is; you don’t have to unlock anything to move the scope. This is especially handy when your tracking a fast moving animal like a wolf, bear, or flying eagle in the wild, and once the animal being followed stops, you don’t have to lock the head in place to keep it in place. A quick release plate makes it very easy and super fast to set the equipment up. You don’t want to be fumbling around with screws, etc…….in the field. Especially when its cold and your wearing gloves. 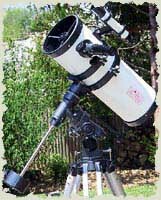 Telescopes are fairly fragile instruments, and best used on your deck or yard and not transported. A few visitors have used telescopes in place of a spotting scope, but in my experience, most telescopes do not last more than a day after being set up and taken down, then driven, possibly carried and set up again. 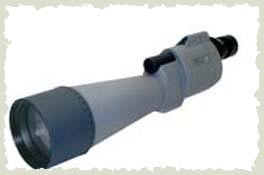 Spotting scopes on the other hand are designed to be tossed around, bounced in the vehicle, and generally withstand shock and stress without any harm. Anyway…….that’s my story and I’m sticking to it! I hope that this information will help make your decision making process an easier one, and make your visit to Yellowstone or other National Park a successful and enjoyable one. Now get out of that chair and go out and enjoy our wild America!